Interview with Askia Toure / "Africans Only People In Antiquity Who Shared Male & Female Leadership"
Whether or not you’ve heard of him makes no difference. Assume that--like the rest of us-- you’ve been deprived of one of the most influential voices of the Black Arts Movement. However, if 2006 were a renaissance; if now was the undisputed time, then it would become increasingly important to hip ourselves to the artistry of one Askia Toure. Although Toure is very seldom discussed in scholarly circles--especially in English literature programs--it should not be surprising, nor should it signify anything in particular about the value of Toure in the cultivation of the Black Arts Movement of the 60s and 70s. If anything, Toure has been--like many other African scholars--placed in the hierarchy of African poets. And as we’re beginning to see, such an unwelcome ordering of our leadership becomes problematic simply because the natural pattern of the African experience is necessarily cyclical. Hence, any imposed hierarchy that would attempt to diminish the function of Toure as a prominent figure within the Black Arts Movement, is crafted outside the realm of our best interests. At first glance, one might make the mistake of sizing up Askia Toure as a powerful, poetic voice of the past. However, what is most impressive about Toure is his consistency. Aside from his poetry, heavily laden with historical references to the experiences of African people, Toure demonstrates his committment to the long view of African history in his latest book “Dawnsong: The Epic Memory of Askia Toure.” In “Dawnsong,” Toure presents readers with a poetic rendition of Ancient Kemet (or the Classical period of the regions now referred to as Egypt, Ethiopia and the Sudan). In essence, Toure provides a lens through which we, the seemingly removed descendants of this civilization, can effectively see ourselves. Among other things, Toure focuses on what he refers to as the Maatic Worldview--providing Kemetic Terminology for what is often called the African Worldview. According to Toure, this perspective of Africa provides a “more humane view of existence,” where African people can view themselves as participants in a world of balance and order. Toure also makes a specific point of paying homage to the Bimsha, or the “ebony-skinned Black woman who is the original archetype of the beauty of humanity.” With this in mind, Toure includes specific references to the African origins of the builders of Ancient Kemet. He pays particular attention to the Twa of Central Africa (derogatorily termed the Pygmies), who are credited with being the ancestors of all humanity--the Ancient Kemites in particular. If we were to accept the European imposition of our leadership, academic or otherwise, then we would simply end here. We would also take Amiri Baraka’s word for it (stated in the above epithet), purchase Toure’s latest book and move forward. However, as budding African scholars, is it not important to investigate further? Should it not be a principal concern to delve into the thoughts and experiences of this African elder who played an important role in extending the foundation on which we leisurely graze our intellects? In February of this year, the Arts Sanctuary, a Philadelphia-based organization dedicated to the artistry of African people, hosted its 22nd Annual Celebration of Black Writing (artsanctuary.com). Featuring a plethora of “Black Artists” (including essential artists like Amiri Baraka, Mari Evans, Sonia Sanchez, Haki Madhubuti, Barbara Ann Teer and The Last Poets), the celebration also honored Askia Toure as a significant figure among his peers. While the more recognizable names and faces were a part of the symposium, it is important to note that Toure was one of a few who actually held his own workshop, during which he proceeded to expose attendees to a crash course in the long view of African history. More importantly, Toure attempted to teach the footnotes of his writing, which are found throughout “Dawnsong,” exemplifying the essence of the Black Arts Movement. 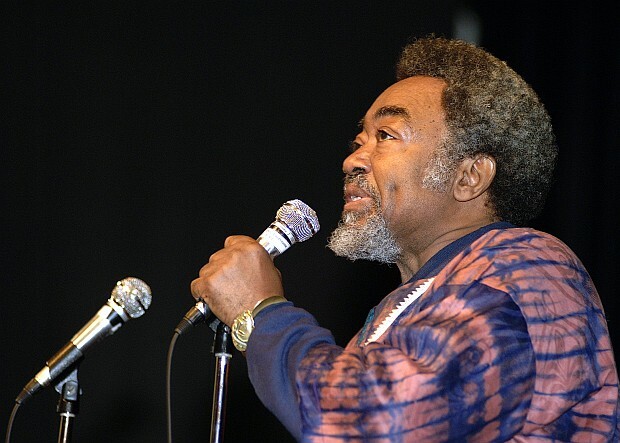 Despite being pushed under the rug of the academic community, Toure continues to work towards the agenda of the Black Arts Movement, using words and sounds to transmit messages to African people. According to Toure, “A people’s culture--their myths and archetypes--is that language by which that particular people is recognized by humanity.” However, Toure is set apart from the genre of cultural nationalism, for he works deliberately towards liberation. Toure says that a necessary task is: “To imagine a better world: what would a liberated future be and how would we organize steps to that future? To liberate yourself, you have to develop steps towards that goal.” As one of the first Africana studies teachers (labeled as such), Toure joined the first Afro-American Studies Department at San Francisco State University in 1967. Recruited by his friend and fellow poet Sonia Sanchez, who he knew from his days in Harlem, Toure worked with Sanchez and Baraka under Dr. Nathan Hare in the newly formed department. What is most important about Toure’s journey is his involvement in the rudimentary development of several political and intellectual movements. “I tell brothers and sisters this all the time: Black studies didn’t begin in San Francisco State,” he says. “Classes in San Francisco were in the community, in the hood. Classes were held in churches, community centers, etc. When we went to San Francisco State, we brought the hood with us. We brought the grassroots people from the neighborhoods; some of our best students were the students from the community who did the assignments and didn’t even receive grades [or course credit] for them.” According to Toure, the Black Power Movement facilitated the infusion of the Independent Schools with the white campus. It would appear that his background as a teacher in the Freedom Schools of Atlanta and Mississippi cultivated his passion for community-based education. Toure does note that the transition to the white campus was full of interesting interactions with faculty and staff at San Francisco State. “White professors at San Francisco State followed students around and were interested in what we were teaching; they monitored Sonia,” he says. Nonetheless, the program did have a powerful influence on the students who were involved, some of which have resurfaced as important voices among African activists. Toure notes that he, Baraka and Sanchez were professors of Danny Glover--a San Francisco State University graduate--who now appears to be focusing much of his energy towards working with organizations like TransAfrica Forum. “I taught African History to Danny. He also studied under Amiri Baraka who, along with Ed Bullins and Marvin X, formed a Revolutionary Black Arts theater group featuring young brothers like Danny,” he says. He remembers Glover as a noticeably focused student, in tune with the needs of his people. “Danny was very serious, very intense. He didn’t act silly; he wasn’t running behind all the women. He seemed humble.” Toure also remembers that Glover was a member of the Black Panther Party and participated in the independent schools with SNCC. “A number of the brothers were actors. They performed plays like the ‘The First Militant Preacher’ by Ben Caldwell, which were directed by Amiri Baraka. These brothers were organizers, political activists and actors; Danny was always focused on acting as a craft.” Still, Toure affirms that Glover was always deeply involved in the spirit of the times. “Danny’s always been political. When he couldn’t be out front, he showed his financial support.” Toure says that he still maintains an amiable connection with Glover. His years at San Francisco State played an important part in Toure’s development, though he was no stranger to studying Africa. “It is important that African-centered historians interpret our history,” he says. His own fascination with Ancient Kemet--demonstrated throughout “Dawnsong” as well as in earlier pieces like “From the Pyramids to the Projects”--expanded as a result of his scholarship under the guise of prominent historians like Asa Hilliard, Ivan Van Sertima and Charles Finch during the 1980s. A student of Cheikh Anta Diop, Toure believed, “Until Africans united with Ancient Kemet, African culture would not be complete.” When reflecting on his intellectual journey, Toure says, “I saw it as my duty, in writing with these outstanding activists, to try to bring alive the world of our ancestors: to make our ancestors live again through art.” His studies in Ancient Kemet have subsequently informed much of his world view as an artist. It is evident that Toure is committed to preserving the history of Ancient Africa (Kemet) in his works. “I am constantly working, trying to recreate the image of Black people. The further you go back in our history, the greater we become as opposed to others, who are the reverse.” Toure has a special affinity for the Twa peoples, who are considered to be the most ancient group of Africans on earth. “Why hasn’t humanity talked to the Twa peoples who are our oldest ancestors, the oldest human beings on our planet? I would think that the Twa have something to tell us if we would humble ourselves and ask them as our living ancestors.” He notes that the consistency of African culture--from the first humans to the founders of Kemet and the more contemporary African experiences--speaks to the properties of the African World View. As the first and current peoples of the world, the Twa are--according to Toure--a viable source for wisdom. African history: paying homage to the various aspects of the African experience. can be absorbed, appreciated, and more importantly, felt. *Asante Sana, Baba Jabali Wazuri: for sharing his wisdom, books, and exposing me to the work of Askia Toure.